I love to paint in front of people and I love to talk while I paint. It's always really exciting for guests of the event to get to see multiple paintings progress, which is possible because of my fast style. This also allows me to render different scenes during a birthday, tailgate, party, anniversary, wedding, etc... And, when I do events here in Athens, guests appreciate getting to meet a well-known local artist. When it comes to weddings, I work closely with the bride and family to capture these special moments. I see myself like a wedding photographer in that I capture the moment, but I also entertain through my painting and conversation. ● Jamie arrives an hour before the ceremony and will be on site for 4 hours. ● 11” x 14” stretched canvas original painting of a scene chosen by the client. ● Two 7.5” x 11” original studies on Fabiano hot press 140 lb paper. ● Paper studies will be floated (matted) upon delivery to client. ● One Year Anniversary custom painting on Fabiano hot press 140 lb paper offered at a half off price, up to an 11” x 15” floated on a 16” x 20” mat. ● Questions and conversation from guests are welcomed, as Jamie loves to talk while he paints. ● Can choose to upsize from 11x14" canvas to a 16x20" canvas for $1,500. Has your special event already passed? Consider a commission! 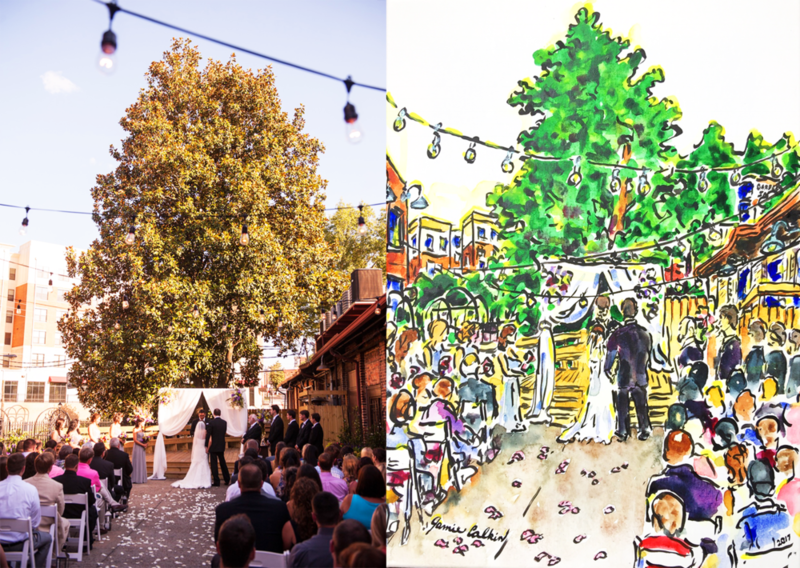 @sweettsheavensentfarm on Instagram shares her testimonial: "Jamie did all three of my children's weddings from my favorite photographs- they are treasures to me"
You can submit a photo for me to paint, after the fact! It's never too late to capture your once-in-a-lifetime moment.